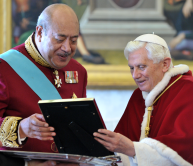 Vatican City, 24 February 2012 (VIS) - This morning the Holy Father Benedict XVI received His Majesty Siaosi Tupou V, King of Tonga. The King subsequently went on to meet with Archbishop Dominique Mamberti, secretary for Relations with States. The cordial discussions dwelt on various aspects of the country's social and economic life, as well as on the positive contribution the Catholic Church makes in various sectors of society, and her activities of human promotion. There followed an exchange of opinions on the international situation, with particular reference to the Pacific island States.